Which train company can I use? There are several rail providers across the UK & Europe but the services between London in England to Sheffield in England are operated by Virgin Trains, First Hull Trains. How much times does it take? 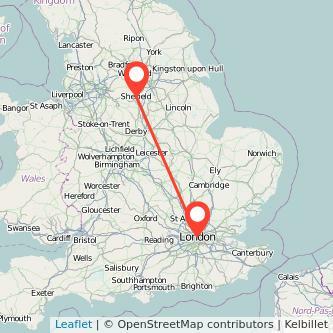 On average, it takes normally 2h16m by train to cover the 142 miles to go to Sheffield from London. The train duration can change depending if the train is direct or with changes. What is the price of a train ticket for this journey? We found trains from £15.00 to travel in the next 30 days. Fares will change depending on the day and hour of travel and how far in advance you purchase your ticket. Find the cheapest tickets to travel from London to Sheffield by train, bus, ride sharing and plane. Ticket prices and availability have been recorded in the last 72 hours from the data provided by our partners. When are the next trains to Sheffield? The table above only shows the remaining services for today and will display a maximum of 10 train departures. Looking at our data, 3 trains from London to Sheffield are being operated today and 0 tomorrow. The first London Sheffield train departs at 10:48 and the last one departs at 17:48. The first and last departure times might change from one day to another and there might be fewer services during weekends and public holidays. Rail operators may also adapt the number of trains during school holidays or depending on the season. The Prices for train tickets London to Sheffield tend to increase the closer you get to your departure day. Based on our data, if you purchase your ticket 2 months in advance, the price of the ticket starts at £15 whereas when booking on the day you're travelling, you will need to spend at least £47 for your trip. Thus, you will save 68% on the price of your ticket by buying your ticket 2 months in advance as opposed to on the day you're travelling. The data are based on the best fares found over the past 6 months when buying in advance versus at the last minute. We compare train ticket for all major companies to travel between London and Sheffield by train and find the best prices for the coming days. Take a look at the prices of train tickets Sheffield to London and find the best deal for your outbound journey. Best prices for the next 30 days. Looking to travel for less? Many railcards and discounts are available to pay less for your London Sheffield train ticket and make even more savings on your tickets: special train fares for children, railcards for all ages, group travel, or charity discount. There are 5 types of railcards available: 16-25 railcard, Two together railcard, Family and Friends Railcard, Senior railcard, Disabled persons railcard. Initially, divide A by B: this will give you the budget from which the card will be profitable. Now divide that number by C. The result is the minimum number of journeys needed throughout the duration of the railcard's validity to be profitable. In our example, A/B = £30/34% = £88.00. Then, 88/£55.77 = 1.58. Your railcard will be worthwile once you will have done at least 2 trips from London to Sheffield (one way trip). Railcards enable you to save 34% off most rail fares for 12 months. A Disabled persons railcard costs £20 and the five other ones £30.